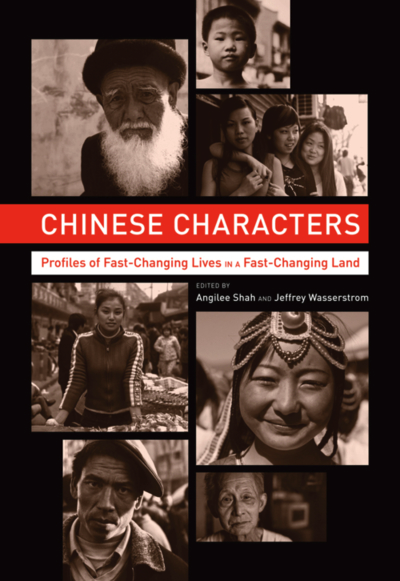 In connection with the launch of the book Chinese Characters: Profiles of Fast-Changing Lives in a Fast-Changing Land, contributor James Carter and co-editor Angilee Shah will discuss everyday life in China today and why it should matter to American readers. Carter is professor of history at St. Joseph’s University in Pennsylvania and his chapter in Chinese Characters looks at the life of a religious figure who has moved between China and the U.S. Shah is a journalist whose work has been featured in LA Weekly, the Far Eastern Economic Review and Mother Jones, among other outlets. An artist paints landscapes of faraway places that she cannot identify in order to find her place in the global economy. A migrant worker sorts recyclables and thinks deeply about the soul of his country, while a Taoist mystic struggles to keep his traditions alive. An entrepreneur capitalizes on a growing car culture by trying to convince people not to buy cars. And a 90-year-old woman remembers how the oldest neighborhoods of her city used to be. These are the exciting and saddening, humorous and confusing stories of utterly ordinary people who are living through China’s extraordinary transformations. The immense variety in the lives of these Chinese characters dispels any lingering sense that China has a monolithic population or is just a place where dissidents fight Communist Party loyalists and laborers create goods for millionaires. Chinese Characters is a collection, as Pankaj Mishra writes in his foreword, “to herald a new golden age of journalism about a ceaselessly fascinating country.” Contributors include a Pulitzer Prize winning journalist, a Macarthur Fellow, the China correspondent to a major Indian newspaper, and scholars whose depth of understanding is matched only by the humanity with which they treat their subjects. Their stories together create a multi-faceted portrait of a country in motion and an introduction to some of the best writing on China today. Contributors include: Alec Ash, James Carter, Leslie T. Chang, Xujun Eberlein, Harriet Evans, Anna Greenspan, Peter Hessler, Ian Johnson, Ananth Krishnan, Christina Larson, Michelle Dammon Loyalka, James Millward, Evan Osnos, Jeffrey Prescott, Megan Shank, with cover photos by Howard French.